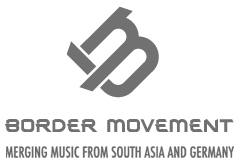 At Border Movement, we’re interested in the way that music evolves and spreads; across globes, across countries, across cultures, communities, and classes. And we save “classes” for the last item on the list because without transmission across classes, the other forms of musical exchange often don’t occur. This is because of a truth that we often try to ignore; even in the context of creating art, money matters. Music making is a collaborative and discursive process. It thrives when musicians are able to hear music made by others, and to have their own music heard. We often wonder at the untold scores of musical geniuses labouring across the subcontinent over jerry-rigged instruments or pirated copies of Fruity Loops, creating amazing sounds that we will never hear. Without access, there is no collaboration. And those limitations go in both directions. We, the privileged class, see groundbreaking artists from around the world giving innovative performances. Yes, these are parties. But they are also part of the creative germination process. And although some of these performative spaces may be open to all in theory, there are numerous barriers to entry to those from the other side of the tracks. When we speak of the uptown-downtown dynamic, we are – in a sense – speaking of a very specific event in the cultural transmission of music; the spread of hip-hop in New York City in the early 1980s. But taken more broadly, this concept represents a crucial link in shared creativity. Hip-hop’s roots lie primarily in the Bronx and Harlem areas of New York City; Uptown. The tastemakers, art school kids, models, and assorted cool white kids with money – those, in other words, who turn the heads of record executives – lived downtown. And so for several years after the birth of hip-hop in the late 1970s, the genre was largely confined to a very small geographical area. It would probably be overreaching to give Charlie Ahearn credit for the global spread of hip-hop today, but we might not be overreaching by much. Ahearn – a white guy from upstate New York, former art school kid and art filmmaker – developed an interest in hip-hop when filming a low budget martial arts movie on New York’s Lower East Side. This interest led him to explore the city’s burgeoning uptown hip-hop scene, and eventually to write and direct his signature film, Wild Style. On one point, we must be clear: Wild Style isn’t a particularly good film. The production value is poor, the dialogue stilted, and the acting – predominantly by high profile members of the New York hip-hop community, rather than professional actors – is often painfully wooden. But these shortcomings are irrelevant to our purpose. The brilliance of Wild Style is not in its strength as a film, but in its ability to bridge disparate artistic communities, and to bring a new and experimental art form to a far wider audience than had previously seemed possible. The sonic landscape of India is ripe for a thousand Wild Styles. Artists such as Slum Gods, Word Sound Power, and DJ Uri are beginning to find ways to cross the class barrier, but much more work needs to be done. For our part, we’re eager to explore any avenues by with the processes of artistic collaboration are enriched. In geographical terms Bandra West is much closer to Dharavi than Greenwich Village to the Bronx. But it is probably much further in the minds of the most Bombay residents. Border Movement hopes to begin the process of bridging that gap. This post is an introduction to what is sure to an ongoing theme on our pages.